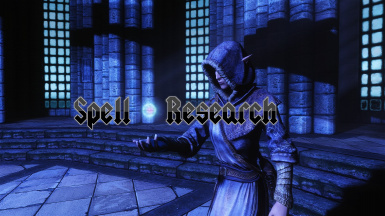 Adds a completely new system to research and discover spells from any supported spell mod. As well as adding an in-built spell tome and scroll crafting system, a Victorian-Era style alchemy system, where you can dissolve items, and mix or analyze the resultant solutions, and expands the lore of magic with dozens of texts and artifacts to find. More Valuable Spell Tomes Not REQUIRED, just highly recommended. -A lot of back-end script changes and optimizations. Clean Save Required! -Drastically reduced the value of artifacts. They can still be decomposed and the resulting solutions can be sold. -Completely changed the way artifacts and ancient texts work in the background, hopefully fixing any issues with them not being removed properly. -Translation Tomes are now useful after you have some experience with a language. -Added CACO version 1.2 support. -Changed a few of the archetypes for some vanilla ingredients. -Added page numbers to the Experience tab in the MCM menu. -Made a handful of other miscellaneous changes. I always felt that there was something missing in the magic game play of Skyrim. You could become the arch-mage, ally of the Psiiic Order, and a master of every single school of magic, but you only ever got spells by buying them off of other mages. Other mods have already tried to alleviate this through other methods. Requiem gives you new spells whenever you get a new perk in a magic skill. And of course the excellent mod Spell Crafting for Skyrim adds in the simplistic yet effective spell crafting system from previous games. However there was something missing from these mods as well. Magic is not something you can simply understand by taking a perk, or meticulously craft to fit your each and every need. It is elusive, complex, it defies simplicity. To even attempt to understand it, you need to do what seemingly every other mage in Skyrim is doing; you need to do some research. So, after over a year and a half of on and off coding, balancing, and testing, I bring you Spell Research, a truly different spell crafting system. With this system, by the time you actually become a master of magic, you will feel like you earned your place among legends. You will have spent days, weeks, or possibly months, of game time frantically spent studying spells and relics just to add one more spell to your repertoire. Additionally, new avenues of game play are opened up. 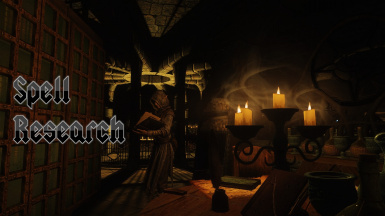 You can finally roleplay as the cowardly scholar, spending all his time studying alone in a dusty tower. You can finally effectively utilize scrolls, once you write enough of them yourself with this mod's in-built scroll crafting system. 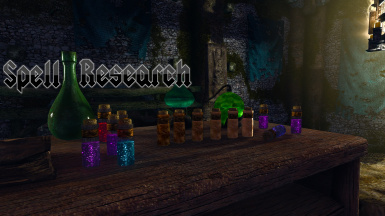 Alchemists will also have reason to use this mod, as you can now dissolve items using Alembics and Cauldrons, then analyze and mix them in a Victorian-Era-esque system to mass produce powerful alchemical solutions, or further enhance your knowledge of the magical world. 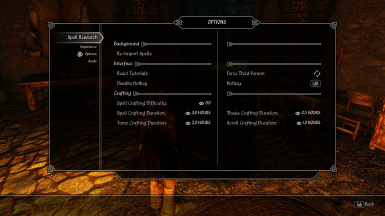 In this mod, spells are not simple mixtures of cantrips or effects, but each spell is a completely unique piece of art, and each mage casts each spell slightly differently. Instead of studying what spells are 'made' of, you study how to manipulate and invoke magic. This system is told in terms of Archetypes, the elements and techniques you need to understand in order to cast spells. You can discover and study these elements and techniques through several ways. You can spend several in-game days studying your own spells in a comfortable tower. You can dissolve and analyze the tons of ingredients and potions you have stored. Or you can go out to find and study ancient text, tomes, and artifacts. Once you have discovered and studied enough Archetypes you can then compose magical Theses. Using these you can try to compose a spell. The theses you use will determine what kind of spell you are trying to find, and what rank the spell will be. Even this is not cut and dry. Spell composition is not an easy task, and by default it will take a lot of trial and effort to compose your first spell. Even then, you may not fully succeed. The spell you end up getting will be drawn from a pool of spells, from your favorite spell mods, that utilize the archetypes you used. You can also use the added alchemy system to gain more experience, or gain powerful solutions. Using the added Alembic or Cauldron, you can dissolve ingredients and artifacts you have found into distilled liquids. You can then analyze these liquids to learn more about spell research, or you can experiment with them to create and ultimately mass-produce powerful alchemical ingredients. Adventurers will also be able to use this system, as they will find several relics of past experiments and research. Use these to gain more knowledge of spell research, or sell them for a fair few septims. Be warned that some of these relics are fragile and can break easily, while others are more than eager to break you. This can be a confusing and difficult system. Thankfully I added several options via the MCM to alleviate this. 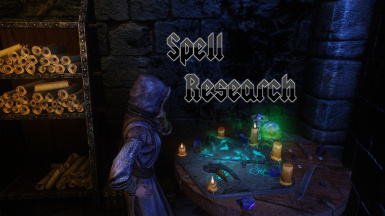 You can change the difficulty of spell crafting at any time, you can add a hotkey to utilize some of your tools without opening the inventory, you can check your progress in researching spell archetypes, and if you are ever confused you can look at the comprehensive in-game guide. Ultimately, this mod adds in unique and useful crafting systems, adds in dozens of interesting items to find, and opens up whole new avenues of game play. I hope you enjoy it. This mod can be installed at any point, except when Urag is translating some of Shalidor's notes. You should install it with your preferred mod manager. You should also install any supported spell mods that you want to import into Spell Research, as well as SKSE and SkyUI. The supported mods are listed under the Compatibility section. Once you have installed everything and loaded up the game, open the MCM menu, and click "Import Spells" under the options page. Importing spells may take a few minutes, so wait until you are in a safe location before importing spells. You should re-import these spells from the MCM menu anytime you install or uninstall a supported spell mod. 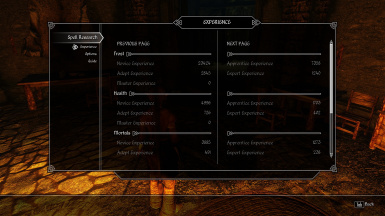 This mod can be uninstalled at any point, as long as you are not importing spells, researching, or are mentally exhausted. This mod is compatible with almost any other mod. It edits a handful of leveled lists, miscellaneous items, and some containers. However these issues can be fixed via a simple Wyre Bash or TES5edit patch. Use unsupported versions at your own risk! If you use unsupported versions then you will likely experience issues. The scroll and tome crafting systems may break. You may be given broken or depreciated spells through the crafting system. However, if you try newer versions and encounter issues, you can simply roll back to the supported version. Also, you can still have unsupported versions installed in tandem with this mod. Simply decline to import the mod's spells in-game when prompted. If you want your mod or one of your favorite spell mods to be supported by this one, you can use the supplied importer executable. Send me a message and the file you made with that executable via a PM, and I'll include it in the mod. Before you start your research into magic, you need to get some supplies. To start your research, you need to get discover and study some spell archetypes. The easiest way to do this is to study the spells you know. To do this select your research journal in your inventory, and select "Begin Research" while you have supported spells equipped. You can repeatedly cast the spells you have equipped. However, this can be very monotonous and tedious. 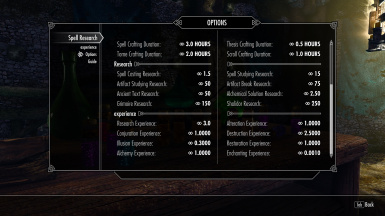 You can use your Research Journal again, and select "Perform Research", you will then be able to study your spells for a number of in-game hours. However, this will leave you "Mentally Exhausted", lowering your maximum Magicka. Simply sleep to recover. When you are done researching, use your Research Journal and select "Stop Research". Once you have enough experience with spell archetypes, you can compose a thesis on one. Use your Research Journal, and select "Compose Thesis". You will then be able to write a thesis on any archetypes you have discovered. Theses require writing materials, as well as sufficient mental energy, or Magicka, to write out the magical theory. Writing theses will also leave you mentally exhausted. You can attempt to write a thesis of any complexity as soon as you discover the archetype. However, more complex theses require more materials, and if you do not have the necessary experience with that archetype when you try a spell composition, then that thesis will likely have mistakes and the composition will fail. Once you have enough theses you can attempt to compose a spell. Again, use your Research Journal, and select "Compose Spell". You will then choose which theses you will use in the spells composition. The theses you use will determine what spell you are trying to find, as well as its complexity. If you use all novice theses, you will get a novice spell. If you use several adept theses, and one apprentice thesis, you will get an apprentice spell. Composing a spell will also require sufficient mental energy, or Magicka, and will leave you mentally drained. To increase chances of success, use as many theses as you can, there is no consequences for using too many. You should also have sufficient experience of all the archetypes you plan to use, and experience in the school of magic you are looking in. To further increase your knowledge of spell archetypes, you can continue studying your spells, or expand your repertoire of studying techniques. However, I'll let you discover them for yourselves, you can find the in-game books by Feros Nightfall to learn about these other techniques as well as some lore explanation. Alternatively, you can just look at the guide in the MCM to tell you about all of the items and systems this mod adds. The easiest and the slowest way to perform spell research. As explained above, you perform research this way by studying the spells you already know. Simply follow the quickstart guide above to get started down this path. 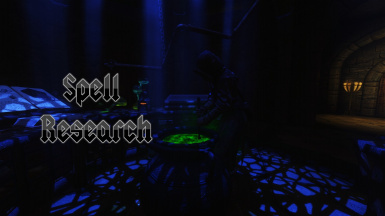 Additionally, you can craft Scrolls and Tomes using the Research Journal. Simply equip the spell you want to write down in your right hand, then click "Craft Tome" or "Craft Scroll". Crafting these requires paper, ink, and exhaust you mentally, just like composing theses. You should also know that most of these activities gives you experience in an appropriate school of magic. Studying spells, and writing scrolls and tomes give you experience. Alchemy can be a much quicker way to gain experience about spell archetypes, however, it notoriously requires a large amount of material. To get started down this path, you need an Alembic, and possibly a Cauldron. Both of these items can be bought from apothecaries, or crafted at a smith. Also, spell vendors sometimes carry alembics for sale. You will also need a large supply of ingredients or potions, and possibly artifacts (see the section below). The gardening system from Hearthfire may actually be useful here. Once you have enough materials you can start dissolving. Use your alembic, then select "Dissolve Items", you can then place in your alembic ingredients, potions, or artifacts to dissolve. However, alembics can only dissolve a small amount of material at a time. So they are often used as field tools. To dissolve larger amounts at a time, you need to use a Cauldron. Once you have acquired a cauldron, you need to place it. Simply use it in your inventory, and it will be placed in front of you. Additionally, for a cauldron to dissolve items, you need to supply it with fuel. It is fueled with ingredients and potions that have "Weakness" effects. Cauldrons lose any remaining fuel when they are moved, keep that in mind when you place them. Dissolving items will give you a large amount of bizarre liquids, which you can then use in your alembic. You can either select "Analyze Liquids", which will have you perform some tests on these liquids, which will in turn give you some experience in spell archetypes. This also gives you some experience in your Alchemy skill. You can also select "Mix Ingredients". This will allow to mix together three of these liquids to create alchemical ingredients to be used in the vanilla alchemy system. You can also create rare vanilla ingredients and other useful materials if you find the required materials. If you manage to find the right recipes you can mass produce a large amount of powerful potions. By far the least grindy path, and also the most dangerous. In your adventurers you may find remnants of past experiments to study, or sell. If you find these old enchantment experiments, you can study them in three ways. You can study the item by flooding it with magic, and studying the resulting effects. This will only give you experience in one archetype at a time, and will require blacksmith's tongs for you to handle the item safely while studying it. If you aren't skilled in enchanting, the artifact might explode from your spells. Select "Study Item" after selecting the artifact in your inventory. Alternatively, you can study all of its archetypes at once, by overwhelming the artifact with magic, and then smashing it with a hammer, because why not? Select "Break Item" after selecting the artifact in your inventory. Or, you can chuck them in a cauldron. Including these failed enchanting experiments, there are unique or rare objects that you may find from vanilla questing. Before you complete your quest, try to study them. They may give you some unique insight. These items are likely indestructible, so there's no risk to your quest in studying them. These texts are the remnants of research done by ancient civilizations and mages, and are written in ancient languages. If you manage to become proficient in their language, you can potentially learn large amounts about spell archetypes. Once you find a text, you can to translate them on the spot, simply use the item and select "Attempt Translation". You probably won't be able to translate them immediately, and need something to jump-start your knowledge. You can buy translation tomes from mages, or possibly find them on warlocks. These will allow you translate some texts if you have no experience with that language, but they become useless once you have some grasp in the language. Select "Analyze Text" to give you an idea of the general style of the language, and possibly figure out which language it is, and which translation tome you need. Or, you can try to figure it out by trial, error, and chance, as some texts may have portions written in the common tongue, which will allow you to translate the tome, and give you some experience in the language. A final note, these texts are incredibly ancient, and fragile. There are usually only a handful of legible pages in each text, and simply flipping through them may destroy them. If you have sufficient experience with enchanting items, your hands may be careful enough to handle them. These are the riskiest relics you may find in your adventures, and by far the most valuable. They are the notes taken by powerful, and incredibly paranoid, mages of old. These old tomes can contain a near endless amount of knowledge, but at the same time they are incredibly dangerous. When you find one of these arcane books, you can attempt to read through them. Simply use them in your inventory, and select "View Lightly", "Read Fully", or "Study Intensely". The more intensely you read a grimoire, the more you will likely gain from it. However, you are also more likely to read and trigger a trapped passage in the grimoire. When you read from a grimoire, you may find some short passages describing spell archetypes, completed theses, and if you are incredibly lucky, completed spell compositions, depending on how deeply you read. On the other hand, if you trigger a trapped passage a number of things can happen. The grimoire may destroy itself, and any knowledge within. It may also drain you mentally. If you are incredibly unlucky, or careless, it may force you to forget one of your spells. Again, depending on how deeply you read. You can reduce your chances of reading a trapped passage by being focused, ie, having a large pool of Magicka. A final relic you can obtain are Shalidor's Insights. These can only be obtained by going through the vanilla quest of the same name, given by Urag at the College of Winterhold. These are fairly simple relics, simply use them in your inventory and you will gain some experience about a random archetype, as well as gain some experience in the relevant school of magic. Well wishes on your studies.